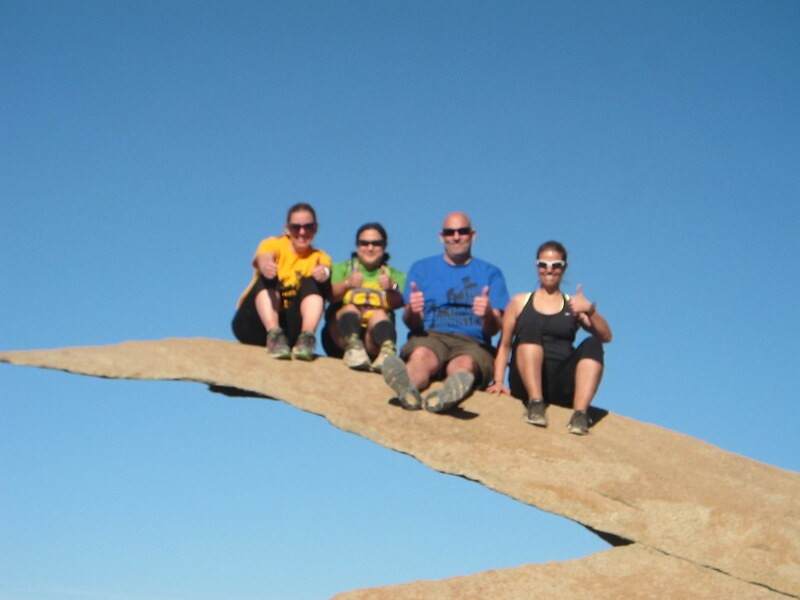 The Green Girl hiked to Potato Chip Rock with her SparkPeople SparkFriends Jeannie, Kelly, and Leah. 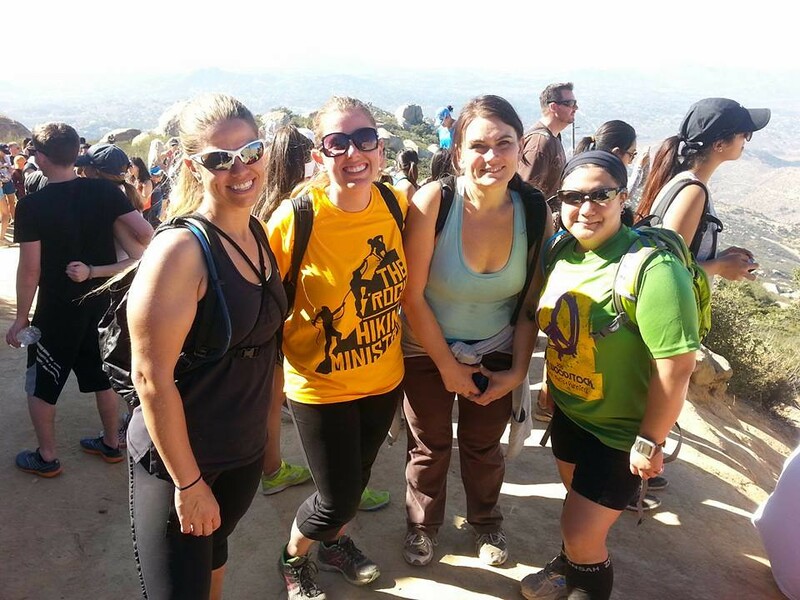 Kelly and Leah invited Jeannie and me to join their Rock Church Hiking with SPF hiking ministry's hike to Potato Chip Rock after Kelly saw 'Visit Potato Chip Rock' was #83 on the The Green Girl's 100 Things in 2014 list. Potato Chip Rock is located in the Lake Poway Recreation Area just below the summit of Mount Woodson Trail. 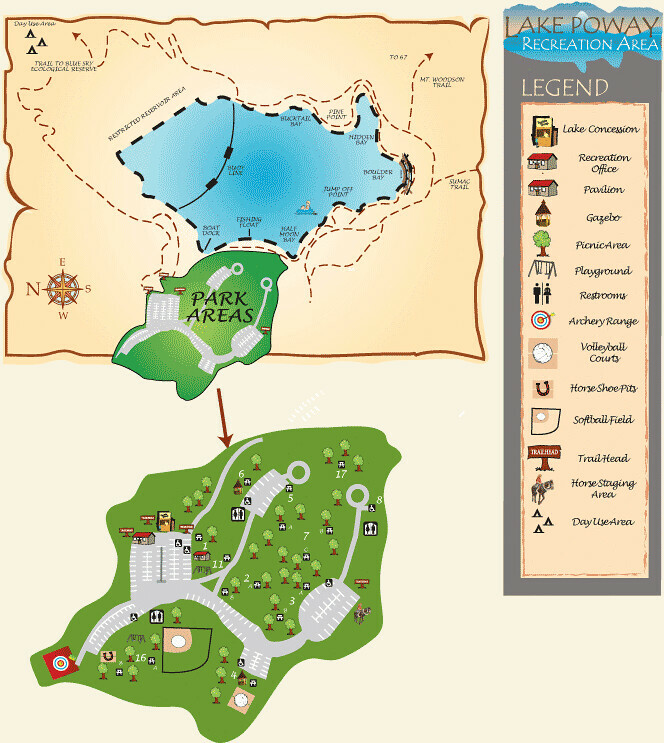 The Lake Poway Recreation Area is surrounded by 400 acres of Clyde E. Rexrode Wilderness Area. 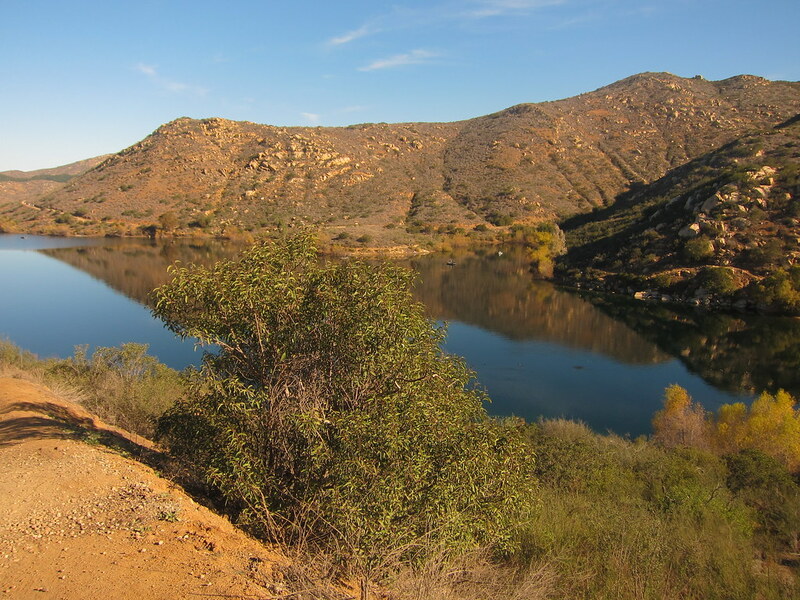 The City of Poway trails system extends over 55 miles. 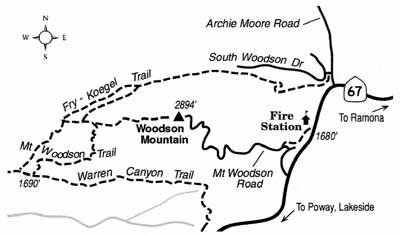 There are two hiking routes that will take you to Potato Chip Rock: Mount Woodson Road (3.6 mostly paved, steeper miles roundtrip) or Mount Woodson Trail (7.6 dirt trail miles roundtrip). 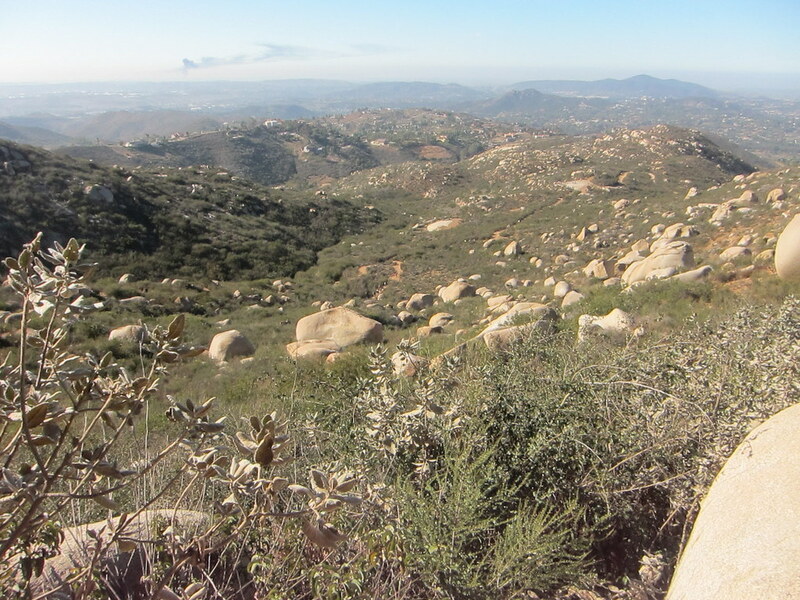 From the east, the trailhead is near the Ramona Fire Station. Parking is available on the west shoulder of Highway 67. We hiked to Potato Chip Rock via the Mount Woodson Trail from the west. We met in the Lake Poway parking lot, walked down to the boat dock, followed the paved path counterclockwise around the lake, and headed east to the Mount Woodson Trail trailhead. As we ascended, we were afforded a beautiful panoramic view of Lake Poway behind us. Mount Woodson is famous for the boulders that are scattered across the chaparral-covered hillsides. The trail was well marked and the dirt was hard packed - not overly loose or sandy. Some sections consisted of large, irregularly shaped rock steps. 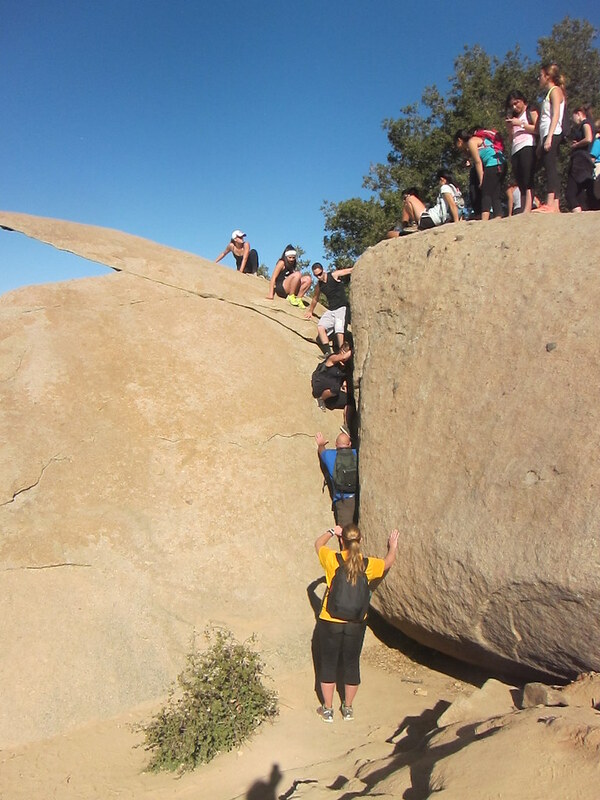 I'm fairly certain I spotted the line for Potato Chip Rock well before I saw the actual rock. 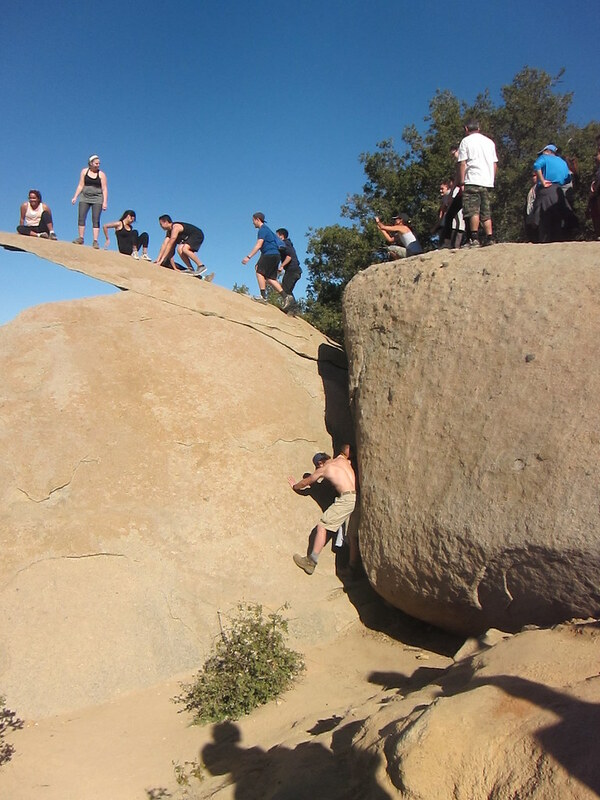 As we waited our turn, we came to the realization that we had to leap from a boulder to get to the Potato Chip Rock. We nervously watched those ahead of us navigate the jump as we made an effort to mentally prepare ourselves. It was nerve racking to witness the acrobatic feats people were attempting atop the precipice. 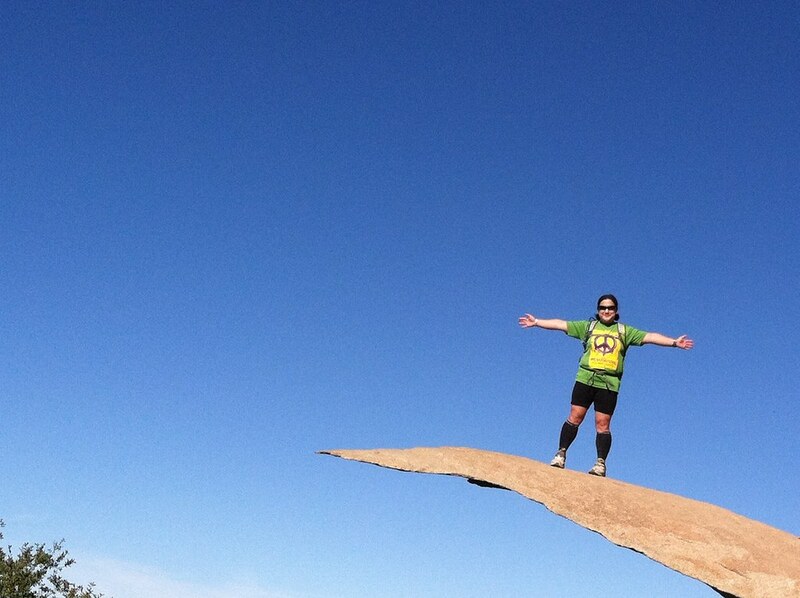 Any indication of imbalance resulted in an audible collective gasp from the onlooking future Potato Chip Rock climbers. The more audacious the attempt, the louder the response. 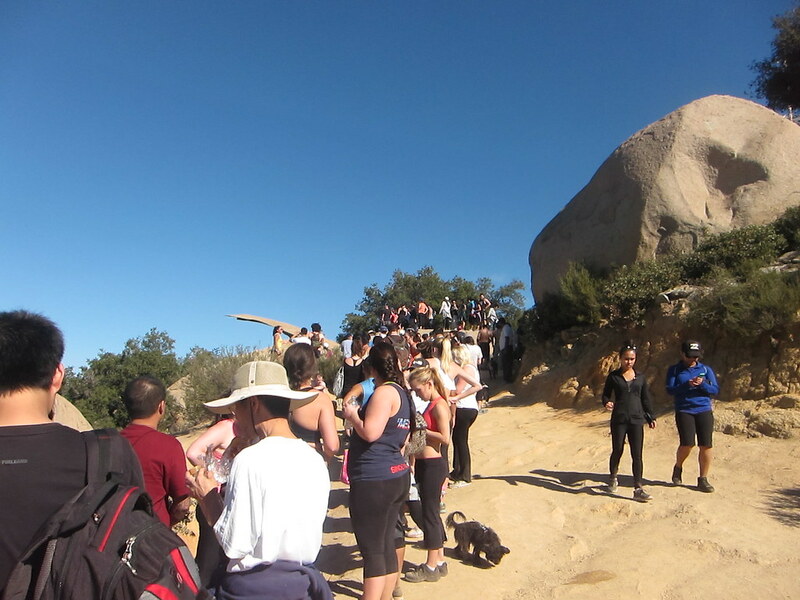 As I stood in line, I realized the climb onto Potato Chip Rock was outside of my 'Safety First' comfort zone. After some internal dialogue, I convinced myself I could walk halfway out and get that picture I'd so earnestly wished for. Jeannie offered to stay behind and be our photographer so we left her with all our cameras and phones. When it was our turn to climb, I was grateful that Kelly and Leah's friend, Glenn, had joined us. He easily made the leap across to the Potato Chip boulder ahead of us. He then guided us to sit at the edge and envision a running start as we held his hand and threw ourselves onto the side of Potato Chip Rock. Once on Potato Chip Rock, we cautiously crawled out as far as we dared and carefully posed so Jeannie could snap our respective pictures. We all silently hoped the rock wouldn't crack before we could shimmy back down to safety. I'd expected Potato Chip Rock to be flat and but it was uneven and it slightly peaked in the middle. I peered down to see what was below but all I could see was tree branches and leaves. Glenn also assisted us with the descent. He instructed me to slide down until it was too steep and then to reach out with my hands and push against the other boulder. He explained I needed to push in opposite directions with my hands and feet to get myself down. When I struggled, he reached up and supported my feet. From down there, we climbed easily back up to the trail and headed back down. The hike took about 4 hours. It took us 2 hours to hike up to Potato Chip Rock, 1 hour was spent waiting in line to get our pictures, and it took less than 1 hour for us to get back down to the Lake Poway Recreation Center parking lot. Thank you, Jeannie, Kelly, and Leah, for helping me cross #83 off my 100 Things in 2014.